Our (Harry Robinson’s Body Shop) receptionist, Michelle had a great idea to add a box of little toy soldiers with a sign saying “please take a soldier home to remind you to pray for those who serve our country”. I love this idea for any business. I especially love it because many of the body shop staff are veterans & everyone in the body shop volunteers for active duty & veteran causes. If you ever find yourself in need of body shop services come see us & take a toy soldier with you to help you remember our troops in your prayers. Up to $4,000 Sign on/Relocation Bonus. Experienced Collision Tech. The right candidate will have structure experience with OEM procedures. Must be proficient in welding, researching OEM requirements and have ICAR or ASE certificates. Fast paced shop with trending growth and up to date equipment. We believe not only in providing ongoing training, but also rewarding outstanding effort and results through bonus and commission programs. Paid Holidays, Paid Time Off, Health Benefits, Paid Continuing Education, Health Club Memberships, Service labor & Parts Discounts, Employee Vehicle Purchase Program. Clean work environment. Honest, hard working, and fun team. Growing business. 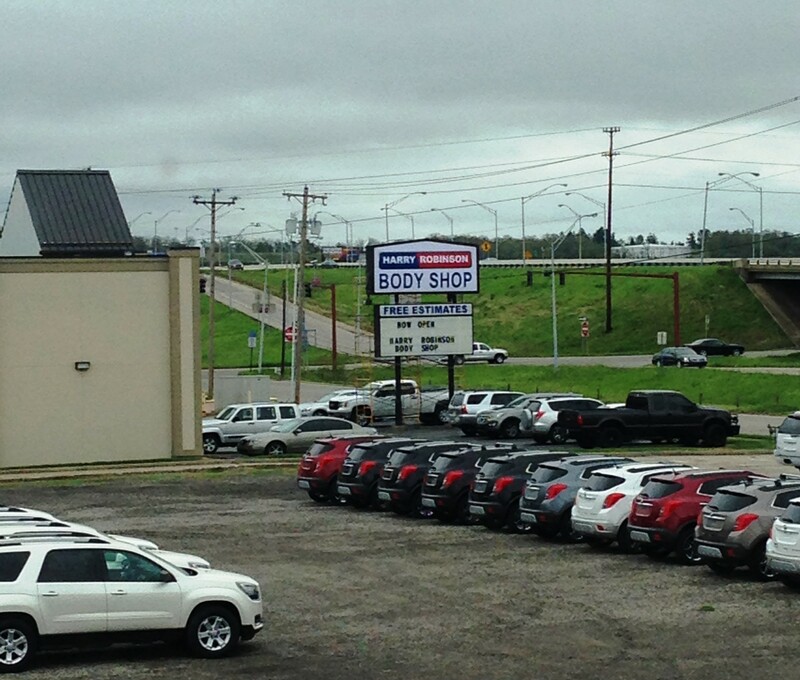 Fort Smith’s Body Shop since 1984! Voted Best Body Shop in the River Valley the last two years. Have you hit a deer? Or, is it, been hit by a deer? They can ravage a vehicle in a hurry. It’s that time of year again! The deer are chasin’. Just last week 2 co-workers hit deer on the way to work. Luckily, we know a good body shop ;). Check out the cutest video ever made about a deer hitting your car! Mike (our manager) brought in his daughter & she did so awesome! Last week we had several people come in to have their vehicle repaired after hitting/ being hit by a deer. If you’ve fallen victim remember we perform the highest quality repairs, take all insurance & repair every make & model. Looking for a collision shop in Fort Smith, AR? Harry Robinson’s Body Shop has been serving the River Valley since 1984. We guarantee all craftsmanship for life. We work on all makes and models of vehicles, and accept all insurances. Voted Best of the Best Body Shop / Collision Center of 2016 & 2017. Schedule Appointment, Give us a call 479-646-8600 or come by 5912 S 36th Street in Fort Smith to get an estimate. Well friends it is that time of the month again. It is time to spotlight an employee here in Harry’s Body Shop. This month I have chosen to spotlight auto body technician, Mr. Richard Wester. Rick joined our team on March 5, 2014. He is a great technician and we love having him around our shop, not only for his awesome work but also for his sense of humor. Around the shop he is known as “Mooie”. Rick is married to his sweetheart, JoLynn. Together Rick and JoLynn have three children and eight grandchildren, who are the light of his life. Rick is a 1978 graduate of Greenwood High School (Bulldogs Baby). He has attended several paint and body schools and is currently I-CAR and GM Certified. Rick loves riding his motorcycle, playing with his grandkids and rooting for the Pittsburgh Steelers. We are very proud of Rick and his accomplishments by being certified. Rick is another link to our chain of awesomeness here in the Body Shop. Keep up the great work Rick! Friends, if you are faced with the need of a Body Shop please remember us while you are picking one. Here at Harry Robinson Body Shop we offer a lifetime warranty on our paint and craftsmanship, frequent updates on your vehicle while it’s being repaired and a nice detail to your car before you pick it up. We will handle all of the hassle with the insurance company so bring all your worries to us! Call us today to schedule your estimate at 479-646-8600. Hello friends, my name is Michelle and I am your smiling office manager at Harry Robinson Buick GMC Body Shop. Has old man winter given you a run of bad luck and left you searching for a collision center? If so, we are the answer to your prayers! 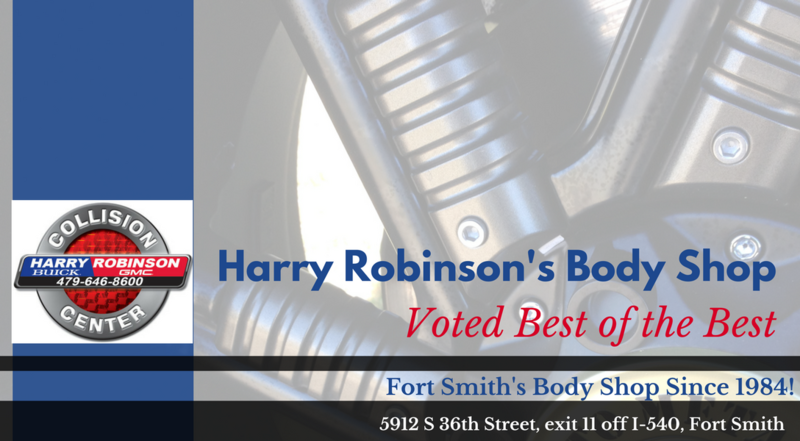 Here at Harry Robinson Body Shop, we will restore your vehicle back to perfect condition. We are a select shop for several insurance companies including Farmers, State Farm and Shelter Insurance. What does that mean for the customer? Its simple, we handle the hassle for you. Bring your vehicle into us for an estimate and leave the rest to us! We will send the photographs and estimate on your vehicle straight to the insurance company and wait for an approval. Once your claim has been approved we will then schedule you for repair. We have some of the best technicians in the area who are certified and are here to repair your vehicle. In our shop we have a new state of the art paint booth running on PPG paint and our shop is one of the few that is dust and climate controlled. If you are looking for a shop to handle your collision needs please keep us in mind. For smiling faces, friendly service and great repair quality choose Harry Robinson Body Shop! Give us a call at 479-646-8600 and let us handle the hassle for you! We want to welcome our new body shop manager, Mike Tisevich. Mike’s not a new face around here. 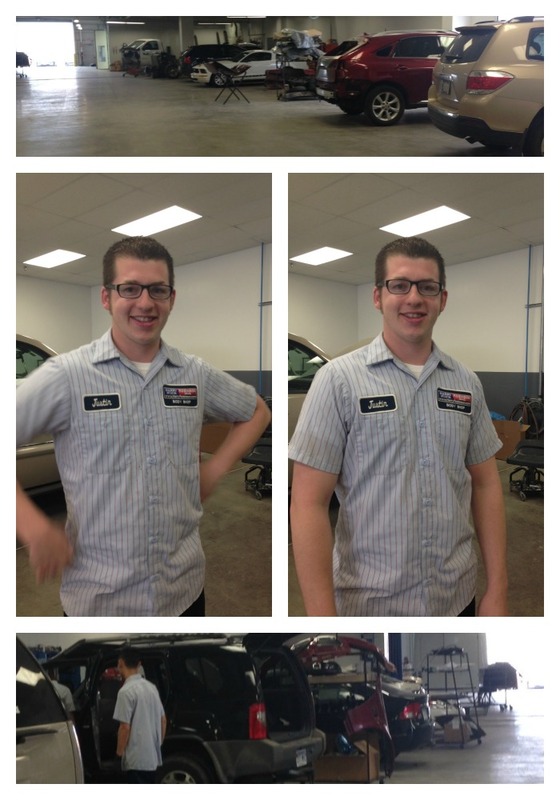 He’s been with us for about 2 years now an estimator, and worked in service before moving over to the body shop. Sam McAllister, our manager of almost 7 years has decided to pursue other passions outside of the auto body industry. Sam has been in the body shop business since 1998 when he wrecked his first car, and his dad made him fix it himself. We are going to miss Sam. He’s been a great mentor to the guys over the years.Mike grew up in Berryville, Arkansas. In 1999, he graduated from North Arkansas College with a degree in Automotive Technology. Mike served in the Army National Guard from 1996-2011 and completed two tours in support of Operation Iraqi Freedom. He earned a Bronze Star for his actions in Iraq. Mike enjoys competition shooting, studying history and watching football. He has been married since 2005, and has four children. Mike is also responsible for nominating Renee for the Patriotic Employer Award in 2012. Office of the Secretary of Defense Employer Support of the Guard and Reserve recognizes Renee Durham of Harry Robinson Buick GMC as aPatriotic Employer for contributing to National Security and Protecting Liberty and Freedom by Supporting Employee Participation in America’s National Guard and Reserve Force. We are so happy to announce this promotion for Mike & we wish Sam all the best!If you have an accident & need a professional auto body repair center to take care of all the details give us a call at 479-646-8600! Some folks were having a hard time seeing our old sign, so we are getting a new one! Hopefully, now everyone will easily be able to find Harry Robinson’s Body Shop. Click here for directions. Thanks for making our body shop such a great success. We have the best customers! Thanks Justin for being awesome! We are so glad you are one of us. If you have had an accident or have any questions about Harry Robinson’s Collision Center please call 479-646-1818, email Mike or see our Q&A’s “Had a wreck, now what?“.